Deadpool is up to his old fourth wall-breaking ways. This time it’s with a clever reference to Vanessa from the Deadpool Movies. Spoilers for Weapon X #23 by Greg Pak, Fred Van Lente, Yildiray Cinar, and Frank D’Armata follow. Deadpool made a surprise appearance in the current storyline in Weapon X. Sabretooth has recently taken control of the Weapon X squad. He’s brought the group back to their mercenary roots and rebranded them as a new version of X-Force, or as it's come to be called, Weapon X-Force. The team’s latest mission is a personal request from Sabretooth himself. He’s looking for Monet St. Croix, aka M. He and M grew close while they were both on Magneto’s X-Men squad. Then M became possessed by her evil, disembodied brother Emplate. She was freed from Emplate’s control since then but has more recently gone missing. Sabretooth managed to track M and find that she’s become part of a cult. X-Force goes in for the rescue and discovers that M and the other cult members are being controlled by Mentallo. Mentallo is a villain capable of using technology to put others under his thrall. Mentallo doesn’t pose too much of a threat to Weapon X-Force, but he has some backup. The cult is well-funded enough to afford the aid of a mercenary, specifically a mercenary with a mouth. Deadpool crashes through the church window and fights Sabretooth’s team. Deadpool has the upper hand when he’s suddenly distracted by the unexpected appearance of his old love Vanessa. 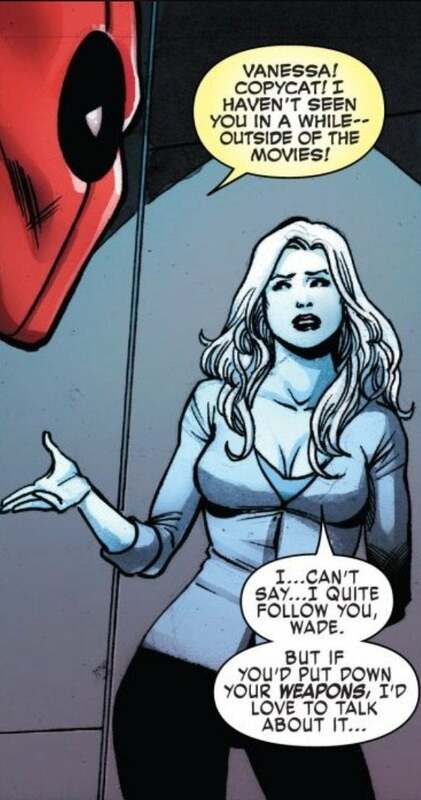 Deadpool quips that he hasn’t seen Vanessa in a while, at least outside of the movies. Vanessa is played by Morena Baccarin in the Deadpool movies. If she looks unfamiliar here, that’s because Baccarin’s live-action Vanessa is a human. Vanessa in the Marvel Comics Universe is a mutant shapeshifter and a mercenary in her own right, known as Copycat. Or at least she was. Copycat died in Deadpool’s arms years ago after Sabretooth mortally wounded her. So how is she here now? Well, she’s actually not. 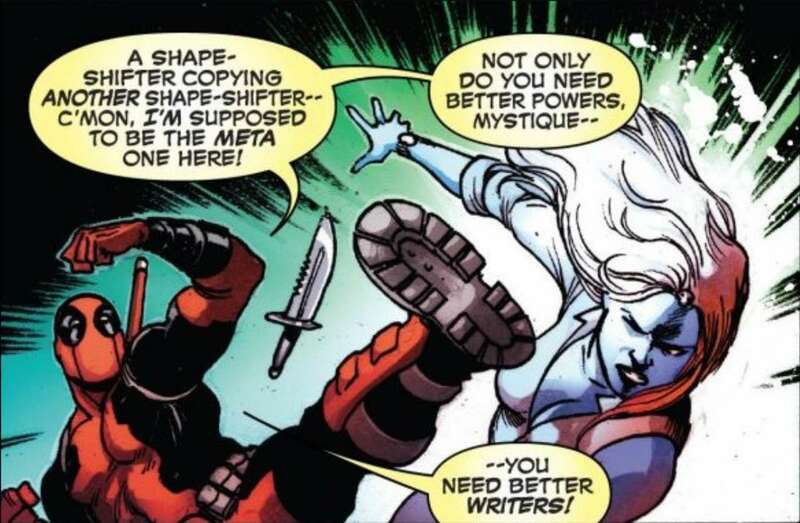 Deadpool realizes that Vanessa is actually Mystique taking on a familiar form to distract him. Yes, that’s one mutant shapeshifter impersonating another, which doesn’t go unremarked by Deadpool. Sabretooth is eventually able to bribe Deadpool over to Weapon X-Force’s side. It’s a good thing too, considering who they’re up against. What do you think of Marvel’s joke about the Deadpool movies’ Vanessa? Let us know in the comments! Weapon X #23 is on sale now.